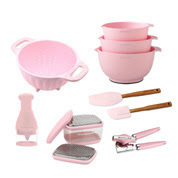 This KitchenAid 9 Piece Cook for the Cure Kitchen Prep Set stocks your kitchen with all the essentials. Cook For The Cure, presented by KitchenAid, will donate a portion of the sales of their pink product collection to the Susan G. Komen for the Cure Breast Cancer Foundation. 9 piece set includes: can opener with lid removal magnet; 5 quart colander; hand-operated chopper with stainless steel blades; grater with stainless steel fine blade, stainless steel coarse blade, and storage lid; 3 piece plastic mixing bowl set with 2-1/2 quart, 3-1/2 quart, and 4-1/2 quart bowls; 13 inch mixer spatula and 11-1/4 inch scraper spatula set. Can opener is hand-wash only, spatulas are hand-wash recommended; all other items are dishwasher safe.